"Archaic Torso of Apollo" by Rainer Maria Rilke is the Songs of Eretz Poem of the Day for May 5, 2014. A link to the poem, as translated by Stephen Mitchell and published by Modern Library in Ahead of All Parting, may be found here: http://www.poets.org/poetsorg/poem/archaic-torso-apollo. 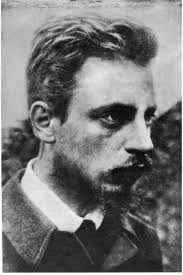 Rainer Maria Rilke (1875 - 1926) (pictured) was born in Prague but traveled throughout Europe for most of his life. He enjoyed his most creative period in France in the early 1900s when he served as Rodin's secretary. Reference to this and additional biographical information may be found here: http://www.poets.org/poetsorg/poet/rainer-maria-rilke. 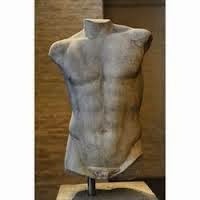 "Archaic Torso of Apollo" is an inspirational ekphrastic poem arranged as two free verse quatrains followed by two free verse tercets. The poem is strictly ekphrastic until the middle of the penultimate line, where the poet suddenly and stunningly turns and pointedly admonishes the reader to "change your life."